Over Christmas I had the luck to be in the vicinity of Morecambe with some patient friends who indulged me in a trip to Sunderland Point (above). 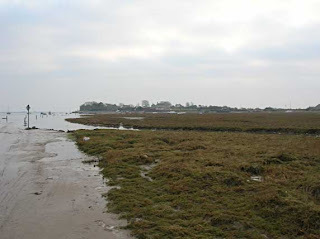 I’d heard about this place as an 18th-century sea port, beautifully preserved and regularly cut off from the mainland at Overton during high tide (it’s usually accessible via a single-track road across a salt marsh, see below). Ships from the West Indies and North America once docked there and I’d heard about a black slave, named Sambo, who died shortly after landing at Sunderland Point and who is buried on some remote part of the shore. I really wanted to see the place, and Sambo’s Grave, but unfortunately the tide was too high and we had to turn back. Returning to Overton we discovered, in true Georgian fashion, that tide info was available at the Globe Hotel. The landlord informed us that the tide was actually rising and would be high for a couple of hours, so we had to carry on our journey, but I hope to see Sambo’s grave some time or another. I’m sure you’ll get to see the grave soon…nice pictures, but it does look a very sad, bleak place (especially at this time of year). It’s a lonley resting place, that’s for sure. Yes, my friends told me it was bleak and had kind of a strange atmopshere. You are a true lady, Mrs Woffington. I’m sure your visit will bring comfort to Sambo’s soul. Thanks Gorilla Bananas, honoured to have a visit from the world’s leading anthropological ape! 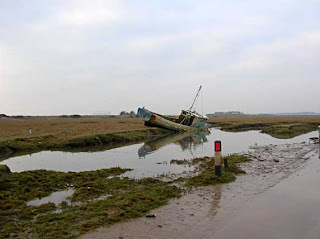 Sunderland Point and its environs is a strange corner of this country. It makes it all the sadder to think it’s the final resting place of this poor Caribbean lad. 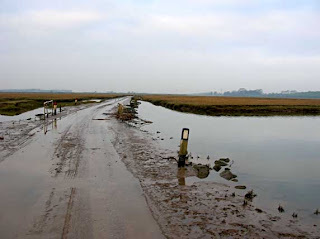 For the hardy, I recommend a night-time trip along the roads to the Point, playing ‘chicken’ with the tides. God forbid, Robinson! But is there anywhere to stay the night once you reach the Point, or are you stuck in your car until some unsociable hour of the next morning?